The latest figures for UK users from the audited ABCes together with Compete‘s figures for American site usage show how USA traffic is vital for UK newspaper sites. On average, US traffic is 36.8 per cent of the UK traffic (i.e. there is just over one US visitor for every 3 UK visitors). The figure for the Telegraph is slightly higher (44.5 per cent) and for the Mail it’s a massive 62.5 per cent. These figures are all for June 2009. The FT wasn’t audited in June’s ABCes. The Express isn’t in the ABCes. They are further proof that the Mail’s success in the June ABCes was driven by American searches for Michael Jackson’s kids. This entry was posted in Newspapers, Traffic and tagged abce, FT.com, guardian, Journalism.co.uk, malcolm coles, michael jackson, newspaper site, The Express, The Sun 2, the Telegraph, uk, United Kingdom, United States, us on July 30, 2009 by Malcolm Coles. The Sun (by an unnamed ‘online reporter but it has now been updated and by-lined) and the Metro (by a by-lined reporter but the link is now dead) – and others too no doubt – tentatively go with ‘reportedly dead.’ And actually attributed TMZ. Then, phew, a mainstream media source finally gives us likely sources to cling onto. The LA Times. Around 23.35 BST (22.35 GMT):The BBC goes for it on TV. 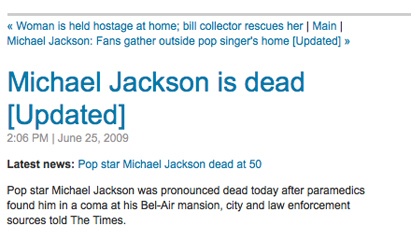 In its special breaking television news report on BBC1 after BBC Question Time, and before This Week, they say that Jackson is reported to be dead: citing the LA Times as the main source, then TMZ.com, and then add that the Associated Press is also reporting the death. Now everyone’s sure that he is dead. The Guardian gets this wonderfully comprehensive tribute article up very quickly (23.26 BST). More views on TMZ and trust on Twitter. One more link-to-print here: the Guardian’s newspaper front page slideshow (presumably a later edition for the Sun). What have we left out? Leave links and comments below, if you’ve got anything to add. 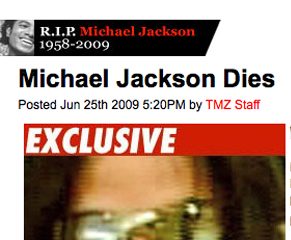 This entry was posted in Online Journalism, Social media and blogging and tagged Alan Citron, Ashley Norris, BBC, LA Times, Meg Pickard, Metro, michael jackson, The Sun, TMZ, tmz.com on June 26, 2009 by Judith Townend.